Our groundwater is being used up at record rates and claims to ownership are becoming increasingly contentious. It won't be long before the first water war begins. There's a lot of water on the planet we inhabit – an estimated 326 million trillion gallons or 1,260,000,000,000,000,000,000 liters. That makes it hard to believe that there are somewhere between 780 million to one billion people without basic and reliable water supplies and that more than two billion people lack the requirements for basic sanitation. Harder still to believe are reports water is going to get much dearer in our near term future – yet Peter Voser the chief executive of the world's second-largest energy company, Royal Dutch Shell, warned us in June 2011, that global demand for fresh water may outstrip supply by as much as 40 per cent in 20 years if current fresh-water consumption trends continue. Our planet is 70 percent covered in ocean, ninety-eight percent of the world’s water is in the oceans – which makes it unfit for drinking or irrigation because of salt. Just two percent of the world’s water is fresh, but the vast majority of our fresh water, 1.6 percent, is in its frozen state and locked up in the polar ice caps and glaciers. Our available freshwater (.396 percent of total supply) is found underground in aquifers and wells (0.36 percent) and the rest of our readily available fresh water, 0.036 percent, is found in lakes and rivers. 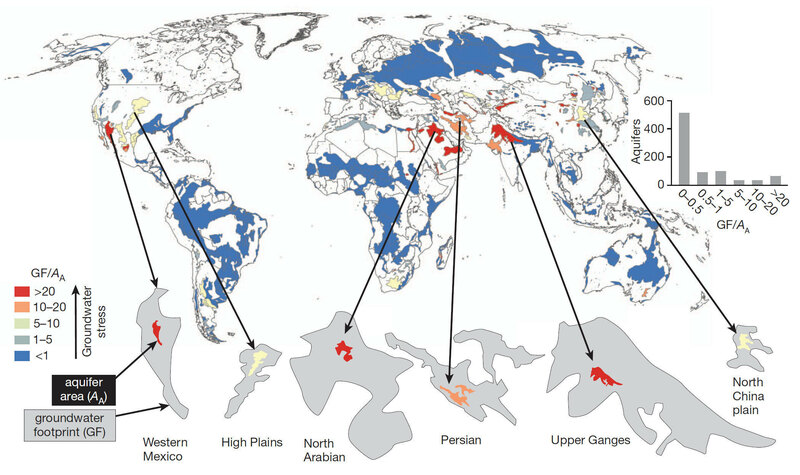 Freshwater aquifers are one of the most important natural resources in the world today, but in recent decades the rate at which we’re pumping them dry has more than doubled. The amount of water pumped has gone from 126 to 283 cubic kilometers per year - if water was pumped as rapidly from the Great Lakes they would be dry in roughly 80 years. These fast shrinking underground reservoirs are essential to life on this planet. They sustain streams, wetlands, and ecosystems and they resist land subsidence and salt water intrusion into our fresh water supplies. Many people think of aquifers as underground lakes but that’s not the case - the water is held between rock particles. Water infiltrates into the soil through pores and cracks until it reaches what is called the zone of saturation - all of the spaces between the rocks are filled with water, not air. This zone of saturation occurs because water infiltrating the soil reaches an impermeable layer of rocks it can’t soak through. Water held in aquifers is known as groundwater. The water table is located at the top of the zone of saturation. Groundwater represents about 30 percent of the available fresh water on the planet - surface water accounts for less than one percent. The rest is locked up in glaciers or the polar ice caps. Almost all of the planet’s liquid fresh water is stored in aquifers. Some of the largest cities in the developing world - Jakarta, Dhaka, Lima, and Mexico City - depend on aquifers for almost all their water. Most rural areas pump groundwater from wells drilled into an aquifer. There are two types of aquifers: replenishable (a permeable layer of rock above the water table and an impermeable one beneath it) and non-replenishable (also known as fossil aquifers, no recharge) aquifers. Most of the aquifers in India and the shallow aquifer under the North China Plain are replenishable. When these are depleted, the maximum rate of pumping is automatically reduced to the rate of recharge or refill. For fossil aquifers - such as the vast U.S. Ogallala aquifer, the deep aquifer under the North China Plain, or the Saudi aquifer - depletion brings pumping to an end. China’s wheat crop is mostly grown in the semi-arid northern part of the country and is particularly vulnerable to water shortages. A World Bank study indicates that China is over pumping three river basins in the north, the Hai, the Yellow and the Huai. Irrigated land accounts for four-fifths of the grain harvest in China. In India the water situation is even more serious - the 21 million wells drilled are lowering water tables in most of the country - in North Gujarat, the water table is falling by 6 meters per year. In the state of Tamil Nadu falling water tables have dried up 95 percent of the wells owned by small farmers. Irrigated land accounts close to three-fifths of the grain harvest in India. Indian water well drillers are now using modified oil drilling technology and going as deep as 1,000 meters. India is the largest user of groundwater resources in the world using an estimated 230 cubic kilometers per year. That figure is more than a quarter of the total world consumption from this resource. In North America the major concern is over water levels in the Ogallala aquifer under the U.S. Great Plains - the world's bread basket. The Ogallala is the world's largest known aquifer having an approximate area of 450,600 square kilometers and stretches from southern South Dakota through parts of Nebraska, Wyoming, Colorado, Kansas, Oklahoma, New Mexico, and northern Texas. The Ogallala Aquifer was formed roughly 10 million years ago when water flowed onto the plains from retreating glaciers and streams of the Rocky Mountains. The Ogallala is no longer being recharged by the Rockies and precipitation in the region is only 30-60 cm per year. In three leading grain producing states - Texas, Oklahoma, and Kansas - the underground water table has dropped by more than 30 meters. In the Pakistani part of the fertile Punjab plain, the drop in water tables appears to be similar to that in India. Iran is over pumping its aquifers by an average of 5 billion tons of water per year. Saudi Arabia, relying heavily on subsidies, developed an extensive irrigated agriculture based on its deep fossil aquifer - and they sucked it dry. Some Saudi farmers are now pumping water from wells that are 4,000 feet deep. In Yemen the water table under most of the country is falling by roughly 2 meters a year. In western Yemen’s Sana’a Basin, the estimated annual water extraction of 224 million tons exceeds the annual recharge of 42 million tons, this drops the water table 6 meters per year. The red area on the above map is the aquifer, the grey area is the size of the area that would be required to catch enough rainfall to replenish that aquifer and make up for all the water currently being pumped out of it. In Mexico the demand for water is outstripping supply. In the agricultural state of Guanajuato the water table is falling by 2 meters or more a year. When groundwater is depleted the effects (besides lessening of supply or no more water) can be drastic. Land subsidence happens when porous formations that once held water collapse resulting in the surface layer settling. Water won’t compress, but when the water is sucked out of an aquifer air fills the void between the rocks where the water use to be. Air compresses and the ground sinks or compacts - the aquifer will never hold the same amount of water again. One study shows that from 1986 to 1992 some parts of the Mexico City Aquifer’s water levels dropped 6 to 10 meters. Areas of Mexico City, as a consequence, have fallen as much as 8.5 meters. The subsidence (ground compaction) is also damaging the sewer system, potentially leading to untreated sewage mixing with fresh water in the aquifer. In March of 2009, Enoch City in Iron County, Cedar Valley Utah, contacted the Utah Geological Survey (UGS) about what they believed to be a fault running through one of their new subdivisions. It was determined by the UGS that it was a fissure caused by the groundwater level dropping as much as 114 feet since 1939 – the cause was determined to be due to pumping more groundwater than is recharged (refilled). Another effect of over pumping is saltwater intrusion. If too much groundwater is pumped out from coastal aquifers saltwater may flow into them causing contamination of the aquifer. Many coastal aquifers - the Biscayne Aquifer near Miami and the New Jersey Coastal Plain aquifer for example - have problems with saltwater intrusion. Streams, rivers and lakes are almost always closely connected with an aquifer. The depletion of aquifers doesn’t allow these surface waters to be recharged - lowering water levels in aquifers is being reflected in reduced amounts of water flowing at the surface. This is happening along the Atlantic Coastal Plain, groundwater depletion is also responsible for the Yellow River in China not reaching the ocean for months at a time, the failure of the Colorado River in the U.S. and the Indus River in Pakistan failing to reach the ocean every day. There is widespread surface and groundwater contamination that makes valuable water supplies unfit for other uses. One of the greatest issues facing us in the 21st century is how we will share this less than half a per cent of usable freshwater to feed our increasing population - if the predicted 40 percent shortfall occurs, and United Nations (UN) population growth estimates are correct, we’ll need to feed nine billion people - two billion more people than today - by 2050 using far less fresh water than we have available today. Advances in technology, innovation, and best practices/conservation are already clashing with finite water resources, relentless population growth, changing diets, a lack of investment in water infrastructure and increased urban, agricultural and industrial water usage. Investment in water management as a percentage of GDP has dropped by half in most countries since the late 1990s. Water is a commodity whose scarcity will have a profound effect on the world within the next decade - the danger to us from the worsening ecological overshoot concerning the world’s fresh water supply makes the reevaluation of our values mandatory. We will have to drastically change the way in which we view our freshwater as a resource. The central issue for us over the next few decades is not the global financial crisis - it is whether humanity can achieve and sustain the enormous harvest we need from this planet to feed ourselves. Are our fresh water resources on your radar screen? WallStreetJournal, SafeHaven, MarketOracle, USAToday, NationalPost, Stockhouse, Lewrockwell, Pinnacledigest, UraniumMiner, Beforeitsnews, SeekingAlpha, MontrealGazette, CaseyResearch, 24hgold, VancouverSun, CBSnews, SilverBearCafe, Infomine, HuffingtonPost, Mineweb, 321Gold, Kitco, Gold-Eagle, The Gold/Energy Reports, CalgaryHerald, ResourceInvestor, Mining.com, Forbes, FNArena, Uraniumseek, FinancialSense, Goldseek, Dallasnews, Vantagewire, Resourceclips and the Association of Mining Analysts.